There comes a time in many gardeners lives, right about at the end of the season, when you’re getting tired of dealing with the produce. This is me now. I’ve known friends and acquaintances who’ve told me they’ve just let the produce go back to the earth, but I just can’t do that. I’ve nurtured the plants from seed, through planting, diseases and weather and these are the fruits – literally – of my labor! 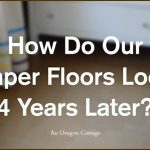 Oh, sure I lose a few here and there when days pass and the pile of produce lingers, but most survive a bit of neglect – and of course my intentions are good, so there’s that. 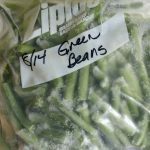 Maybe I’m just fooling myself and my produce just takes a bit longer to go back to the earth – leaving it’s mold and moisture in the fridge for me to clean up that my friends don’t need to deal with. Whatever. 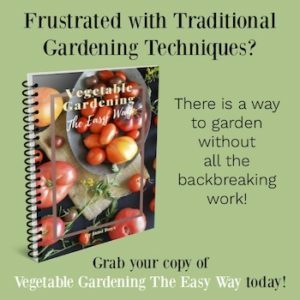 My point is (yes, it’s here somewhere…) that I’m always looking for quick and easy ways to deal with excess produce like tomatoes, peppers, and zucchini at the end of the gardening season. I chop and freeze sweet & hot peppers, which goes really quick and gives me peppers all winter long for soups and stews. 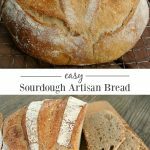 I make zucchini breads, cakes, and cupcakes, freezing these, too. I also pack gallon sized baggies of paste tomatoes into the freezer to await a time I want to can pizza sauce. I’ve made enough batches of delicious, seasoned Roasted Tomato Sauce, my favorite thick Salsa, and Addictive Tomato Chutney. But guess what? I’ve still got tomatoes! And these are the end-of-season tomatoes from dying vines, many with open cracks and so not recommended for canning. 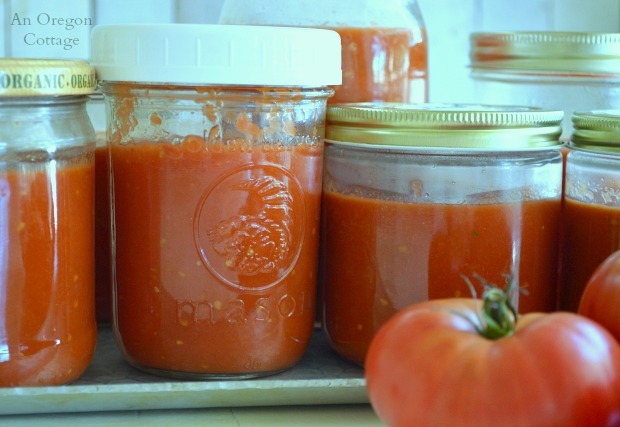 Enter the quickest, easiest tomato sauce ever – one that produces 2-4 quarts of plain, unseasoned tomato sauce to freeze that can be used in any recipe, unlike other seasoned tomato sauces. I’m especially thinking about Mexican dishes – this will make a great base for some homemade enchilada sauce – and homemade tomato soup. 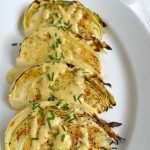 It’s made similar to our seasoned tomato sauce, so you don’t even peel the tomatoes – it’s just a matter of cutting in them in half (or just cutting the tops off of small tomatoes), coring and setting the cut side down in an oiled roasting pan. Some of the peels will be blistered and puffy after roasting and those I will pick off, but all the rest just gets whirred up in the food processor and then added to jars to freeze. When freezing liquids, you need to leave a good inch or more for expansion. You’ll also notice that I used some actual canning jars (which are supposed to be freezer-friendly, too, though I’ve had breaks) as well as some recycled smaller glass jars. That’s because I only use wide-mouth jars for freezing (I seem to have less breakage that way and it’s easier to get the sauce out even if it’s still partially frozen) and I was running low. I’ve actually not noticed much of a difference with recycled pint-sized jars breaking more than canning jars when frozen and I wanted smaller portions of the plain sauce to use in recipes. 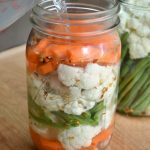 Do you use recycled jars to freeze liquids, too? Anyway, I’m happy to have a stash of plain tomato sauce that took me about an hour to make and I’m even more happy that these tomatoes didn’t go to waste. 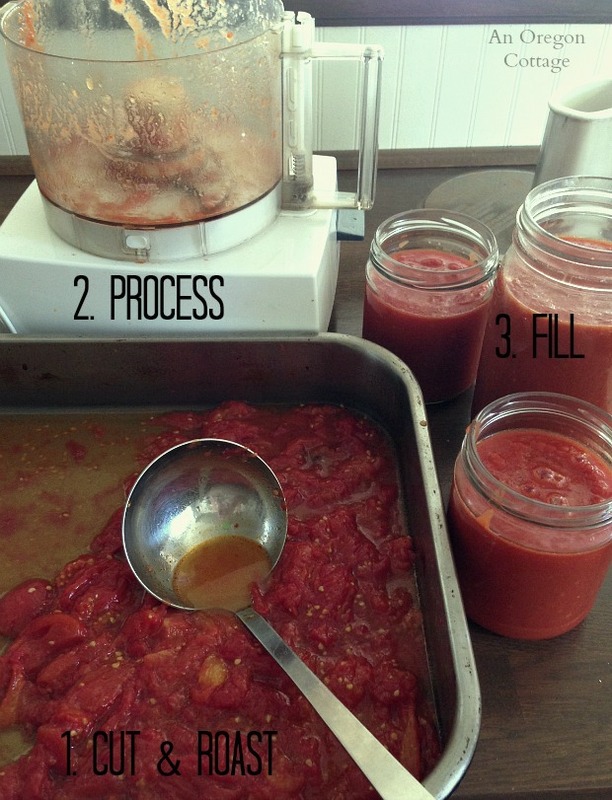 I’m providing a ‘recipe’ for you to do the same if you have a surplus of tomatoes, but it’s actually more of a ‘just do it’ type of process that will work with however many tomatoes you have (or that you can fit in your pans). 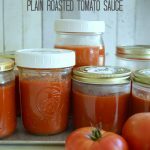 And if you make it, be sure to let us know what you plan to use it for, since I’d love to get new ways to use up this easy plain tomato sauce. 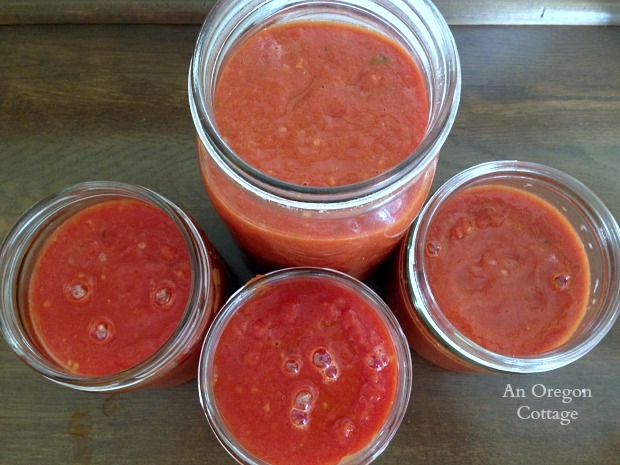 An quick and versatile way to preserve tomatoes into a plain sauce that can be frozen and then used in any recipe that calls for tomato sauce. Prep however many baking pans you need for your tomatoes, or will fit in your oven by spreading 1-2 tablespoons of olive oil on the bottoms. Cut large tomatoes in half, core and slice off blossom ends. Set cut side down in oiled pans. For smaller tomatoes, simply slice the tops, core and set sliced top down in pan (the blossom ends of smaller tomatoes aren’t usually noticeable, but if they are, go ahead and slice them off, too). Fill the pan(s) with a single layer of tomatoes. It’s okay for them to touch, but don’t heap them on top of each other. 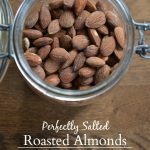 Sprinkle with a teaspoon or two of salt, if desired. Roast for 40-45 minutes, turning half way through (in a non-convection oven) and rotating if using more than one pan until the tops of many tomatoes are blistering and puffing up. Remove from oven and cool for about 10 minutes. While cooling, use tongs to remove blackened tomato skins as needed. 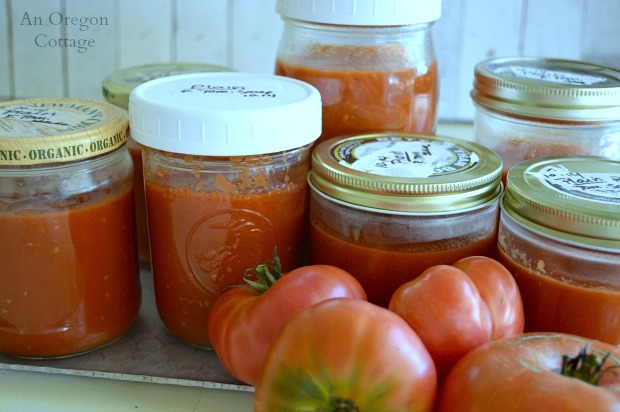 Spoon an even amount of tomatoes and juices into a blender or food processor, process until smooth and then transfer to freezer jars or containers, leaving 1-inch or more room at the top for expansion. Add lids, label with name and date (I use masking tape and a sharpie) and freeze. This sauce will last for a year or more in the freezer. 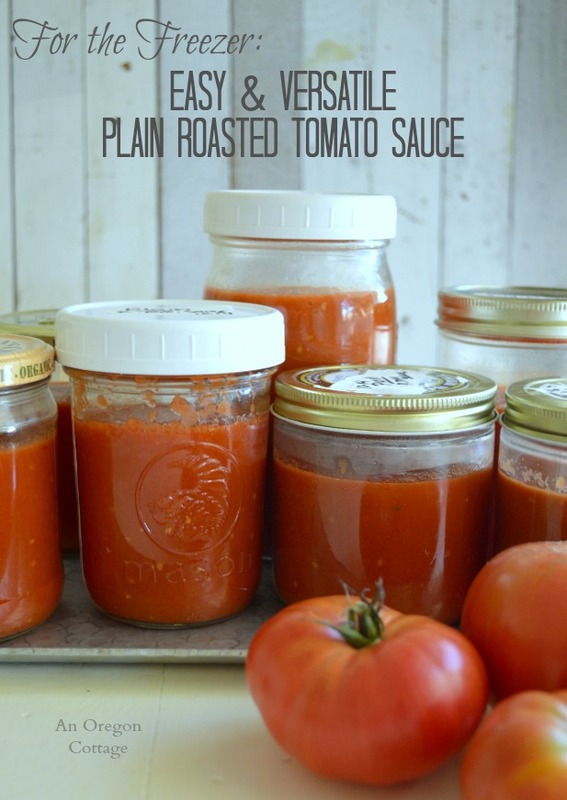 Use this plain tomato sauce in any recipe that calls for a can of tomato sauce like soups, enchiladas and stews. oh shoot! Could have used this recipe to use up some of my tomatoes. Just finished making oodles of freezer spaghetti sauce but some plain tomato sauce would have been nice to freeze as well. I’ll print this off for next year! Thanks!